Shrubs erect or prostrate, 0.5--1 m. Bark gray, cracked and fissured. Branches opposite or whorled, rigid, angle of divergence about 30°. Twigs pale green, becoming yellow with age, not viscid, usually smooth or very slightly scabrous, with numerous longitudinal grooves; internodes 1--5 cm. Terminal buds conic, 1--3 mm, apex obtuse. 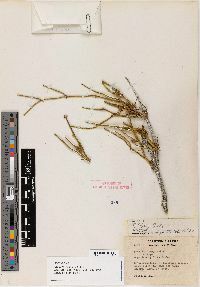 Leaves opposite, 1--3 mm, connate to 1/2--3/4 their length; bases membranous, brown, shredding and becoming gray with age, ± persistent; apex obtuse. Pollen cones 2--several at node, ellipsoid to obovoid, 4--8 mm, sessile; bracts opposite, 4--8 pairs, light yellow, obovate, 2--3 × 2 mm, membranous, slightly connate at base; bracteoles exceeding bracts; sporangiophores 3--9 mm, 1/4--3/4 exserted, with 6--10 sessile to short-stalked (less than 1 mm) microsporangia. Seed cones 2--several at node, obovoid to ellipsoid, 6--13 mm, sessile or on short peduncles; bracts opposite, 4--7 pairs, elliptic, 3--7 × 2--4 mm, membranous with light brown to green, thickened center and base, slightly connate at base, margins entire. Seeds 1(--2), ellipsoid, 5--12 × 3--5 mm, light brown, longitudinally furrowed. Coning March--April. Dry rocky slopes, washes, and sandy areas; 300--1200 m; Ariz., Calif., Nev., Utah.